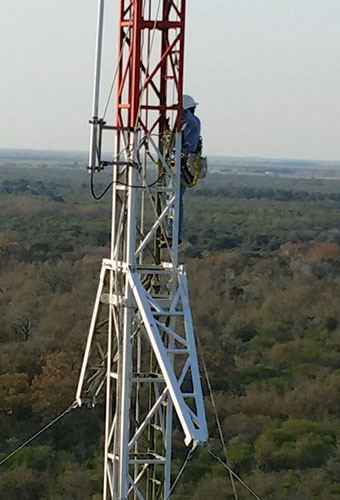 Elite provides tower certified personnel for any communications applications that require climbing or work at heights. Our tower crews are experienced in working both onshore and offshore. Elite's tower crew has decades of experience in many different types of microwave installations on communications towers both offshore and on land. Our installations are complete with spectrum analysis, path alignment and pim and sweep testing. We provide complete tower inspections for various types of tower structures. Our inspections include a detailed analysis as well as photographic documentation of any issues found. Tower lighting beacons are an important safety requirement for all towers. Our team has many years of experience in full light changing services. We specialize in tower lighting from simple bulb changes to troubleshooting photo eyes and various types of lighting control panels. Next time your tower is due for a relamp, ask us about our LED systems. Newer LED systems can save you both time and money. Burn just as bright, but with less power consumption and longer bulb lifetime. 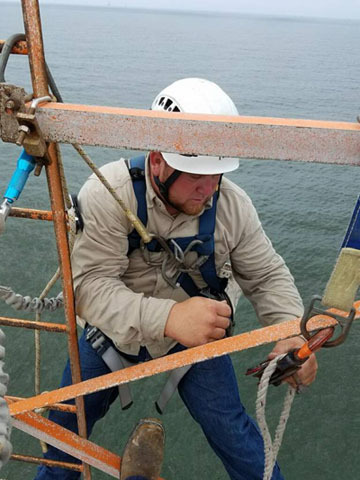 Elite's tower technicians have passed all rigging, safety, and rescue certifications to complete tasks in a safe, accurate and efficient manner. All Elite owned belts, harnesses, pulleys and other climbing apparatus are tested and certified on a regular basis. Safety regulations require that a certified climber have a certified rescue climber present during any climb, mandating a minimum of (2) certified tower technician/workers are required on-site at the time of the climb for all tower work. When working at certain heights, 2 rescue climbers may be required along with the climber doing the actual work.